Greetings! 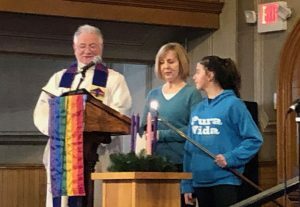 We are a welcoming, fun-loving, inter-generational congregation, with an active Sunday School, youth programs, and Spirit-filled worship services. We try each week to hear God’s Word in fresh new ways, through prayer, music, and preaching. We are growing and reaching out in mission to our community and the world. We welcome all God’s people regardless of race or ethnic origins, marital status, sexual orientation, or prior church experience. Are we the right church for you? Come and see! Worship Service and KEDS (Kids Exploring Discipleship) programs Sundays at 10:30 am. All are welcome to any and all of our services, including communion, and a coffee hour after the service. Additional services on Ash Wednesday, Maundy Thursday, Easter Sunrise, Christmas Eve; see calendar for service times. KEDS programs are on the 2nd, 3rd and 4th Sundays. We are an open and affirming congregation of the United Church of Christ. For events, support groups and activities at this church see our CALENDAR. Our church newsletter is THE MESSENGER.